Nicole Oresme: Therefore, I indeed know nothing except that I know that I know nothing. Nicole Oresme was a brilliant philosopher, psychologist, economist, mathematician, physicist, astronomer and musicologist, a passionate theologian, a competent translator, counselor of the King, Bishop of Lisieux, one of the principal founders of modern sciences, probably the most original thinker of the 14th century and - so to speak - the "French Einstein of the 14th century". And last, but not least, like no other of his time Oresme was able to popularize the sciences. Oresme was born in 1323 (c. 1320-1325) in the village of Allemagne (today's Fleury-sur-Orne) in the vicinity of Caen, Normandy, in the Diocese of Bayeux. Practically nothing is known concerning his family. The fact that Oresme attended the royally sponsored and subsidized College of Navarre, an institution for students too poor to pay their expenses while studying at the University of Paris, makes it probable that he came from a peasant family. Oresme studied the “artes” in Paris (before 1342), together with Jean Buridan (the so-called founder of the French school of natural philosophy), Albert of Saxony and perhaps Marsilius of Inghen, and there received the Magister Artium. A recently discovered papal letter of provision granting Oresme an expectation of a benefice establishes that he was already a regent master in arts by 1342. This early dating of Oresme's arts degree places him at Paris during the crisis over William of Ockham's natural philosophy. In 1348, he was a student of theology in Paris, in 1356, he received his doctorate and in the same year he became grand master (grand-maître) of the Collège de Navarre. Many of his most thoughtful Latin treatises antedate 1360 (see the chronology of his works), and show that Oresme was already an established schoolman of teh highest reputation, which attracted the attention of the royal family, and brought him into intimate contact with the future Charles V in 1356. Beginning in 1356, during the captivity of his father, John II, in England, Charles acted as regent and from 1364 until 1380, King of France. On November 2, 1359, Oresme became "secretaire du roi" and in the period following, it appears that he became chaplain and counsellor to the king. There is a long tradition that says that Nicole Oresme was also the tutor to the dauphin (who later became Charles V), but this is not quite certain. Charles appears to have had the highest esteem for Oresme’s character and talents, often followed his counsel, and made him write many works in French for the purpose of popularizing the sciences and of developing a taste for learning in the kingdom. At Charles’ insistence Oresme delivered a discourse before the papal court at Avignon, denouncing the ecclesiastical disorder of the time. Much can be said about the fact that Oreseme was a lifelong intimate friend and consultant of King Charles, "Le Sage", until his death in 1380. His influence on Charles’ progressive political, economical, ethical and philosophical thinking was probably quite strong, but an extensive investigation of these facts has not been tackled yet. 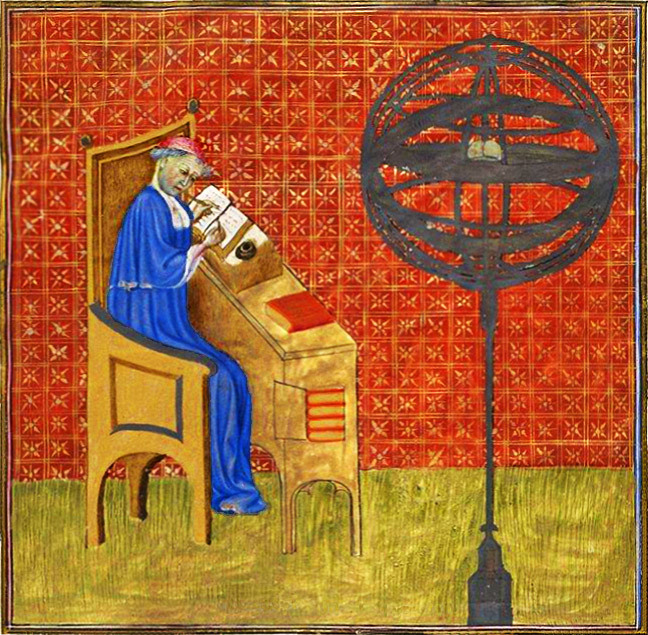 Oresme was the most important person of a choice circle of intellectuals like Raoul de Presle, Philippe de Mézières, etc. at Charles’ court. Royal reliance on Oresme’s capabilities is evidenced, when the grand master of Navarre, was sent by the dauphin to seek a loan from the municipal authorities of Rouen in 1356 (see above) and then in 1360. In 1361, with the support of Charles, while still grand master of Navarre, Oresme was appointed archdeacon of Bayeux. It is knwon that the fervent schoolman Oresme unwillingly surrendered the interesting post of grand master. On November 23, 1362, the year he became master of theology, Oresme was appointed canon of the Cathedral of Rouen. At the time of this appointment, he was still teaching regularly at the University of Paris. On February 10, 1363, he was made a canon at La Saint Chapelle, given a semiprebend and on March 18, 1364, and was elevated to the post of dean of the Cathedral of Rouen. It is likely that the royal hand of John II, the father of Charles, was influenced by the suggestions of the dauphin, in Oresme’s frequent changes of positions. During his tenure in these successive posts at the Cathedral of Rouen (1364-1377), Oresme spent a lot of time in Paris, especially, in the context of attending to the affairs of the University. Even though many documents verify Oresme’s stays in Paris, nevertheless, we cannot infer that he was also teaching there at that time. With the commencement of Oresme’s prolonged translating activities at the request of Charles V, he did reside continuously in Paris, as is shown to be true by letters dating from August 28 to November 11, 1372 sent by Charles to Rouen. Oresme’s residency in Paris appears to have been extended by Charles to 1380, when Oresme began working on his translation of Aristotle’s Ethics in 1369, which appears to be completed in 1370. Aristotle’s Politics and Economics may have been completed between the years of 1372 and 1374, and the De caelo et mundo in 1377. Oresme received a pension from the royal treasury as early as 1371 as a reward for his great labours. Because of Oresme’s untiring work for Charles and the royal family, with the king’s support, on August 3, 1377, Oresme attained the post of Bishop of Lisieux. It appears that Oresme didn’t take up residency at Lisieux until September of 1380, and little is known of the last five years of his life. Oresme died in Lisieux on July 11, 1382, two years after King Charles’ death, and was buried in the cathedral church. Oresme is best known as an economist, mathematician, and a physicist, according Taschow's book "Nicole Oresme und der Frühling der Moderne" also as a musicologist, psychologist and philosopher. Oresme's economic views are contained in "Commentary on the Ethics of Aristotle", of which the French version is dated 1370; "Commentary on the Politics and the Economics of Aristotle", French edition, 1371; and Treatise on Coins (De origine, natura, jure et mutationibus monetarum). These three works were written in both Latin and French; and all of them, especially the last, stamp their author as the precursor of the science of political economy, and reveal his mastery of the French language. In this way, Oresme became a "sooner founder" of the French scientific language and terminology. He created a large number of French scientific terms and anticipated the usage of Latin words in the scientific language of the 18th century. The French "Commentary on the Ethics of Aristotle" was printed in Paris in 1488; that on the Politics and the Economics, in 1489. The Treatise on coins, De origine, natura, jure et mutationibus monetarum was printed in Paris early in the sixteenth century, also at Lyons in 1675, as an appendix to the De re monetaria of Marquardus Freherus, is included in the Sacra bibliotheca sanctorum Patrum of Margaronus de la Bigne IX, (Paris, 1859), p. 159, and in the Acta publica monetaria of David Thomas de Hagelstein (Augsburg, 1642). The Traictié de la première invention des monnoies in French was printed at Bruges in 1477. His most important contributions to mathematics are contained in Tractatus de configuratione qualitatum et motuum, still in manuscript. An abridgment of this work printed as Tractatus de latitudinibus formarum of Johannes de Sancto Martino (1482, 1486, 1505 and 1515), for a long time has been the only source for the study of Oresme's mathematical ideas. In a quality, or accidental form, such as heat, the Scholastics distinguished the intensio (the degree of heat at each point) and the extensio (as the length of the heated rod). These two terms were often replaced by latitudo and longitudo, and from the time of St. Thomas until far into the fourteenth century, there was lively debate on the latitudo formae. For the sake of clarity, Oresme conceived the idea of employing what we should now call rectangular co-ordinates, in modern terminology, a length proportionate to the longitudo was the abscissa at a given point, and a perpendicular at that point, proportional to the latitudo, was the ordinate. Oresme shows that a geometrical property of such a figure could be regarded as corresponding to a property of the form itself. The parameters longitudo and latitudo can vary or remain constant. Oresme defines latitudo uniformis as that which is represented by a line parallel to the longitude, and any other latitudo is difformis; the latitudo uniformiter difformis is represented by a right line inclined to the axis of the longitude. Oresme proved that this definition is equivalent to an algebraic relation in which the longitudes and latitudes of any three points would figure: i.e., he gives the equation of the right line, and thus long precedes Descartes in the invention of analytical geometry. In this doctrine, Oresme extends to figures of three dimensions. Besides the longitude and latitude of a form, he considerd the mensura, or quantitas, of the form, proportional to the area of the figure representing it. He proved this theorem: A form uniformiter difformis has the same quantitiy as a form uniformis of the same longitude and having as latitude the mean between the two extreme limits of the first. He then showed that his method of figuring the latitude of forms is applicable to the movement of a point, on condition that the time is taken as longitude and the speed as latitude; quantity is, then, the space covered in a given time. In virtue of this transposition, the theorem of the latitude uniformiter difformis became the law of the space traversed in case of uniformly varied motion. Oresme's demonstration is exactly the same as that which made Galileo a celebrated person in the seventeenth century. Moreover, this law was never forgotten during the interval between Oresme and Galileo because it was taught at Oxford by William Heytesbury and his followers, then at Paris and in Italy, by all the subsequent followers of this school. In the middle of the sixteenth century, long before Galileo, the Dominican Dominic Soto applied the law to the uniformly accelerated falling of heavy bodies and to the uniformly decreasing ascension of projectiles. For instance, Oresme used this method in his musical section of the Tractatus de configurationibus qualitatum et motuum in context of his overtone or partial tone theory (see below) to produce irrational proportions of sound (ugly timbre or tone colour) in the direction of a “partial tone continuum” (white noise). Finally Oresme was very interested in limits, threshold values and infinite series by means of geometric additions (Tractatus de configurationibus qualitatum et motuum, Questiones super geometriam Euclidis) that prepared the way for the infinitesimal calculus of Descartes and Galileo. For Oresme’s anticipation of modern stochastic, see below under the heading of "Natural Philosophy". In Oresme's "configuratio qualitatum and the functional pluridimensionality" associated with it , one can see that they are closely related to contemporary musicological diagrams, and most importantly, to musical notation, which equally quantifies and visually represents the variations of a sonus according to given measures of extensio (time intervals) and intensio (pitch). The complex notational representations of music became, in Oresme's work, configurationes qualitatum or difformitates compositae, music functioning once more as the legitimating paradigm. But the sphere of music did not only provide Oresme's theory with an empirical legitimating, it also helped to exemplify the various types of uniform and difform configurations Oresme had developed, notably the idea that the configurationes endowed qualities with specific effects, aesthetical or otherwise, which could be analytically captured by their geometric representation. This last point helps explain Oresme's overarching aesthetical approach to natural phenomena, which was based on the conviction that the aesthetic evaluation of (graphically representable) sense experience provided an adequate principle of analysis. In this context, music played once more an important role as the model for the "aesthetics of complexity and of the infinite" favored by the mentalité of the fourteenth century. Oresme sought the parameters of the sonus experimentally both on the microstructural, acoustical level of the single tone and on the macrostructural level of unison or polyphonic music. In attempting to capture analytically the various physical, psychological and aesthetic parameters of the sonus according to extensio and intensio, Oresme wished to represent them as the conditions for the infinitely variable grades of pulchritudo and turpitudo. The degree to which he developed this method is unique for the Middle Ages, representing the most complete mathematical description of musical phenomena before Galileo's Discorsi. Noteworthy in this enterprise is not only the discovery of “partial tones”or overtones three centuries before Marin Mersenne, but also the recognition of the relation between overtones and tone colour, which Oresme explained in a detailed physico-mathematical theory, whose level of complexity was only to be reached again in the nineteenth century by Hermann von Helmholtz. Finally, we must also mention Oresme’s mechanistic understanding of the sonus in his Tractatus de configuratione et qualitatum motuum as a specific discontinuous type of movement (vibration), of resonance as an overtone phenomenon, and of the relation of consonance and dissonance, which went even beyond the successful but wrong coincidence theory of consonance formulated in the seventeenth century. Oresme's demonstration of a correspondence between a mathematical method (configuration qualitatum et motuum) and a physical phenomenon (sound) represents an exceptionally rare case, both for the fourteenth century, at large, and for Oresme’s work in particular. The sections of the Tractatus de configurationibus dealing with music are milestones in the development of the quantifying spirit that characterizes the modern epoch. - music philosophy (in De commensurabilitate vel incommensurabilitate). With his very special "theory of species" (multiplicatio specierum) Oresme formulated the first and correct theory of "wave-mechanics of sound and light", 300 years before Christian Huygens where Oresme describes a pure energy-transport without material spreading. The terminus "species" in Oresme’s sense means the same as our modern term "wave form". Oresme discovered also the phenomenon of partial tones (overtones), 300 years before Mersenne (see above) and the relation between overtones and tone colour, 450 years before Joseph Sauveur. In his very detailed "physico-mathematical theory of partial tones and tone colour", Oresme anticipated the nineteenth century theory of Hermann von Helmholtz. In his musical aesthetics, Oresme formulated a modern subjective "theory of perception", which was not the perception of objective beauty of God’s creation, but the constructive process of perception, which causes the perception of beauty or ugliness in the senses. Therefore, one can see that every individual perceives another "world". Many of Oresme’s insights in other disciplines like mathematics, physics, philosophy, psychology, which anticipate the self-image of modern times, are closely bound up with the "Model Music" (unusual for present-day thinking). The Musica functioned as a kind of "Computer of the Middle Ages" and in this sense it represented the all embracing hymn of new quantitative-analytic consciousness in the 14th century. Because of the work of Taschow „Nicole und der Frühling der Moderne“ (see book 2, 3 and 4) it is also known that Oresme was an outstanding psychologist. By using a strong empirical method, Oresme investigated the whole complex of phenomenons of the human psyche. Oresme was confident in the activity of "inner senses" (sensus interior) and in the constructiveness, complexity and subjectivity of the perception of world. By using this quite progressive features, Oresme was a typical exponent of the "Parisian Psychological School" (Jean Buridan, Barthelemy de Bruges, Jean de Jandun, Henry of Hesse, etc.) and his work was closely related with the scientists of optics (Alhazen, Roger Bacon, Witelo, John Pecham, etc.). But in addition, the innovative and bold mind of Oresme, anticipated very important facts of the psychology of the 19th and 20th century, especially, in the fields of cognitive psychology, perception psychology, psychology of consciousness and psycho-physics. Oresme discovered the psychological "unconscious" and its great importance for perception and behaviour. On this basis he formulated his inspired "theory of unconscious conclusions of perception", (500 years before Hermann von Helmholtz) and his "hypothesis of two attentions", concerning the conscious and an unconscious attention as seen in 20th century knowledge. In his modern “theory of cognition”, Oresme showed that no thought-content-like, categories, terms, qualities and quantities, out of human consciousness, exist. For instance, Oresme unmasked the so-called "primary qualities" such as size, position, shape, motion, rest etc. of the 17th century scientists (Galilei, Locke etc.). ), and that they had been seen as objective in outer nature, but should be seen as very complex cognitive constructions of psyche under the individual conditions of the human body and soul. Because reality is only at the "expansionless moment" (instantia) Oresme reasoned that, therefore, no motion could exist except in consciousness. It means that motion is a result of human perception and memory, in the sense, of the active composition of "before" and "later". This clever theory becomes plausible for example in the field of sound. Oresme wrote: "If a creature would exist without memory, it never could hear a sound…" Sound is a human construction and nothing more. In his modern "psycho-cybernetics" and "information theory" Oresme solved the "dualism-problem" of the physical and the psychical world by using the three-part schema "species - materia - qualitas sensibilis" of his brilliant species theory (in modern terms, to information - medium - meaning). The transportable species (information), like a waveform of sound, changes its medium (wood, air, water, nervous system etc.) and the inner sense (sensus interior) constructs by means of "unconscious conclusions" a subjective meaning from it. Oresme had already developed a first "psycho-physics" that shows many similarities with the approach of Gustav Theodor Fechner, the founder of modern psycho-physics. Oresme’s ideas of psyche are strongly mechanistic. Physical and psychical processes are equivalent in their structure of motion (configuratio qualitatum et motuum). Every structure has a qualitative (psychical) and a quantitative (physical) moment, and that is the reason why psychological processes (intensities) can be measured like physical ones. In this way, Oresme supplied the first scientific legitimating of measurement of psyche and contra Aristotle and the Scholastics even of the immaterial soul. However, the strongest focus Oresme drew to the psychology of perception. Among a lot of parts in writings he composed, unique for the whole Middle Ages, a special treatise on perception and its disorder and delusion (De causis mirabilium), where he examined every sense (sight, hearing, touch, smell, taste) and cognitive functions. With the same method used by psychologists of the 20th century, namely by means of analysis of delusions and disorders, Oresme recognized already many essential laws of perception, for instance the "Gestaltgesetze" (shape-law) 500 years before Christian von Ehrenfels, limits of perception (maxima et minima), etc. (see ibid. U. Taschow, "Nicole Oresme und der Frühling der Moderne"). Taschow’s work (Nicole Oresme und der Frühling der Moderne) reveals also the very complex cosmos of Oresme’s philosophical thinking. Oresme anticipated many essential views of the self-image of modern times, such as, his insight into the incommensurability of natural proportions, into the complexity, the indetermination and the infinite changeability of the world, etc. In Oresme’s linear-progressive world every time everything is unique new and by this way also the human knowledge. The excellent model for this new infinite world of the 14th century (in contrast to the in endless repetitions captivated in musica mundana of antiquity) was the Oresmian machina musica. For Oresme the music analogously showed that, with a limited number of proportions and parameters, someone could produce very complex, infinitely varying and never repeating structures (De configurationibus qualitatum et motuum, De commensurabilitate vel incommensurabilitate, Quaestio contra divinatores). That is the same message as of the "chaos theory" of the 20th century where the iteration of the simplest formulas produces a highly complex world with no predictably of behaviour. Based on the musico-mathematical principles of incommensurability, irrationality and complexity, Oresme finally created a dynamic structure-model for the constitution of substantial species and individuals of nature, the so-called "theory of perfectio specierum" (De configurationibus qualitatum et motuum, Quaestiones super de generatione et corruptione, Tractatus de perfectionibus specierum). By means of using an analogy of the musical qualities with the “first and second qualities” of Empedocles, an Oresmian individual turns into a self-organizing system which takes the trouble to get to his optimal system state defending against disturbing environmental influences. This "automatic control loop" influences the substantial form (forma substantialis), already present in the modern sense, in the principles of biological evolution, "adaption" and "mutation" of genetic material. It is quite evident, that Oresme’s revolutionary theory overcame the Aristotelian-scholastic dogma of the unchanging substantial species and anticipated principles of the "system theory", self-organisation and biological evolution of Charles Darwin. A further very progressive approach was Oresme’s extensive investigations of statistical approximate values and measurements by means of margins of error. He formulated his "theory of probabilities", as well as, theories in the psychological, physical and mathematical fields. For instance, Oresme laid down two psychological rules (De causis mirabilium). The first rule says: With an increase in the number of unconscious judgments of perception (depth of meaning) grows the probability of misjudgements and in this way, the probability of errors of perception. The second rule says: The more the number of unconscious judgments of perception exceed a diffuse limit, the more improbable is a fundamental error of perception because never breaks down the vast majority of unconscious judgments. The knowledge-theoretical point of these depending on each other rules is that perception is nothing more than a probability value in the grey area of these two rules. Perception is never an objective “photography” but a complex construction without absolute evidence. Now we provide an example for Oresme’s mathematical anticipation of elements of modern stochastic (De proportionibus proportionum). Oresme states: "If we take a finite multitude of positive integers, then it is the number of perfect integers or the number of cubes much lesser than other numbers." In addition, the more numbers we take, the larger is the relationship of the non-cubes to the cubes or of the imperfect integers to perfect integers. Therefore, if we do not know something about a number then it is probable (verisimile) that this number is not a cube. It is like in game (sicut est in ludis), where somebody asks whether a hidden number is a cube. One has more surety to answer with ‘No’ because this seems to be more probable (probabilius et verisimilius). Oresme than looked at a multitude of 100 different mathematical objects that he had formed in a certain way, and he determined that from it (100 • 99) : 2 = 4950 combinations from each two elements can be formed. From those, 4925 show a certain interesting quality E, whereas the remaining do not have this quality E. Finally, Oresme calculated the quotient 4925 : 25 = 197 : 1 and concluded from it that it is probable (verisimile) that, if someone is looking for such an unknown combination, this will show the quality E.
Thus, Oresme calculated the number of the favourable and the number of the unfavourable cases and their quotients. But yet, he did not have the quotient from the number of the favourable and the entire number of the equally-possible cases. He did not quite have our modern "measure of probability". But Oresme still had developed a clever tool to judge the "easiness" of arrival of an event quantitatively. Oresme used terms for his calculations of probability like verisimile, probabile / probabilius, improbabile / improbabilius, verisimile / verisimilius / maxime verisimile and possibile equaliter. No one before Oresme, and even a long time after him, used these words in context of games and aleatory probabilities. We can find Oresme’s methods again later in Galileo's and Blaire Pascal's works in the 17th century. In conclusion we want to refer shortly to an example of Oresme’s probability theory in physics. In his works De commensurabilitate vel incommensurabilitate, De proportionibus proportionum, Ad pauca respicientes etc. Oresme says: "If we take two unknown natural magnitudes like motion, time, distance, etc., then it is more probable (verisimillius et probabilius) that the ratio of these two are irrational rather than rational. According to Oresme this theorem applies generally to the whole nature, to the earthly and to the celestial world. It has great effect on Oresme’s views of necessity and contingency, and in this way, of his view of the law of nature (leges naturae) and his criticism of astrology (see U. Taschow, "Nicole Oresme und der Frühling der Moderne"). It is obvious that Oresme was inspired for his "probability theory in physics, mathematics and perception psychology" from his work in music: The division of the monochord (sectio canonis) proved the sense of hearing and the "mathematical reason" clearly, that most of the divisions of chords produce irrational, i.e. dissonant intervals (see U. Taschow, "Nicole Oresme und der Frühling der Moderne"). Oresme’s physical teachings are set forth in two French works, the Traité de la sphère, twice printed in Paris (first edition without date; second, 1508), and the Traité du ciel et du monde, written in 1377 at the request of King Charles V, but never printed. In most of the essential problems of statics and dynamics, Oresme follows the opinions advocated in Paris by his predecessor, Jean Buridan de Béthune, and his contemporary, Albert of Saxony. In opposition to the Aristotelian theory of weight, which said that the natural location of heavy bodies is in the centre of the world, and that of light bodies in the concavity of the moon's orb, Oresme countered by proposing the following: "The elements tend to dispose themselves in such a manner that, from the centre to the periphery their specific weight diminishes by degrees." Oresme thought that a similar rule may exist in worlds other than ours. This is the doctrine later substituted for the Aristotelian by Copernicus and his followers, such as Giordano Bruno. The latter argued in a manner so similar to Oresme's that it would seem he had read the Traité du ciel et du monde. But Oresme had a much stronger claim to be regarded as the precursor of Copernicus when one considers what he says of the diurnal motion of the earth, to which he devoted the gloss following chapters xxiv and xxv of the Traité du ciel et du monde. Oresme begins by establishing that no experiment can decide whether the heavens move form east to west or the earth from west to east; for sensible experience can never establish more than one relative motion. He then showed that the reasons proposed by the physics of Aristotle against the movement of the earth were not valid. Oresme than pointed out, in particular, the principle of the solution of the difficulty drawn from the movement of projectiles. Next he solved the objections based on the texts of Holy Scripture. In interpreting these passages he laid down rules universally followed by Catholic exegetics of the present day. Finally, he adduces the argument of simplicity for the theory that the earth moves, and not the heavens, and in the whole of his argument in favour of the earth's motion Oresme is both more explicit and much clearer than that given by Copernicus. Above, we were occupied with Oresme’s theory of wave-mechanics of sound and light. Therefore, it will not astonish us that Oresme for the first time assumed that colour and light are of the same nature. In Oresme’s absolute correct view colour is nothing more than broken and reflected white light: i.e. "the colours are parts of white light". Also this clever theory was inspired by Oresme’s musicological investigations: In his theory of partial tones and tone colour Oresme analogized these musical facts with the phenomenon of mixture of colours on a rotating top. We will close with Oresme’s genial discovery of the curvature of light through atmospheric refraction: In his treatise De visione stellarum Oresme asked if the stars are really where they seem to be. By using optics, Oresme answered that they are not. Two centuries before the Scientific Revolution, Oresme proposed the qualitatively correct solution to the problem of atmospheric refraction that light travels along a curve through a medium of uniformly varying density, and he arrived at this solution using infinitesimals. Oresme concluded that nearly nothing in the heavens or on earth is seen where it truly is, calling all visual sense data into doubt. This solution had escaped both Ptolemy and Alhazen. It had even escaped Kepler in the 17th century, and up to now, the credit for its first discovery has been given to Hooke and its mathematical resolution to Newton. These short excerpts of Oresme's enormous work show that he was one of the most innovative scientists in the "Spring of Modern Age" and a pioneer in the modern world. Unfortunately we must finish here. If you should have more questions than answers after the reading this fragmentary Oresme-biography, then please read my book about Oresme’s thinking in particular and that of the medieval schoolmans in general. It will be quite helpfully in times like the present, in which the "(neo-)objectivism" unfortunately has become socially acceptable again in the humanities as well as in the sciences. Nicole Oresme, Quodlibeta, MS Paris, BN lat. 15126, 98v. The formulations "founder", "anticipation" etc. in this biography could misunderstand in the sense of an anachronism. But in Taschow’s theory of evolutionary consciousness (see Taschow, Nicole Oresme und der Frühling der Moderne) is no place for an idea of linear evolution that would be the decisive condition for a view of anachronism. The peace treaty of Brétigny 1360 rescued John II from his captivity in England. Because of the escape of his son, the duke of Anjou, which leaved in England as hostage, John II came back to London in 1364. On April, 8, 1364, he died there. See Ulrich Taschow, Nicole Oresme und der Frühling der Moderne, Halle 2003, book 1, pages 142-163. See Ulrich Taschow, Nicole Oresme und der Frühling der Moderne, Halle 2003, book 1, pages 59-204. For Oresme's complex musicological writing see also book 3 and 4. Nicole Oresme, Quaestiones de anima: Si esset aliquod animal quod nullo haberet retentivam et non sentiret nisi in praesentia, tunc non proprie perciperet sonum. Patet statim propter hoc quod est res successiva sicut motus; ideo oportet aliqualiter recolere de praeterito. 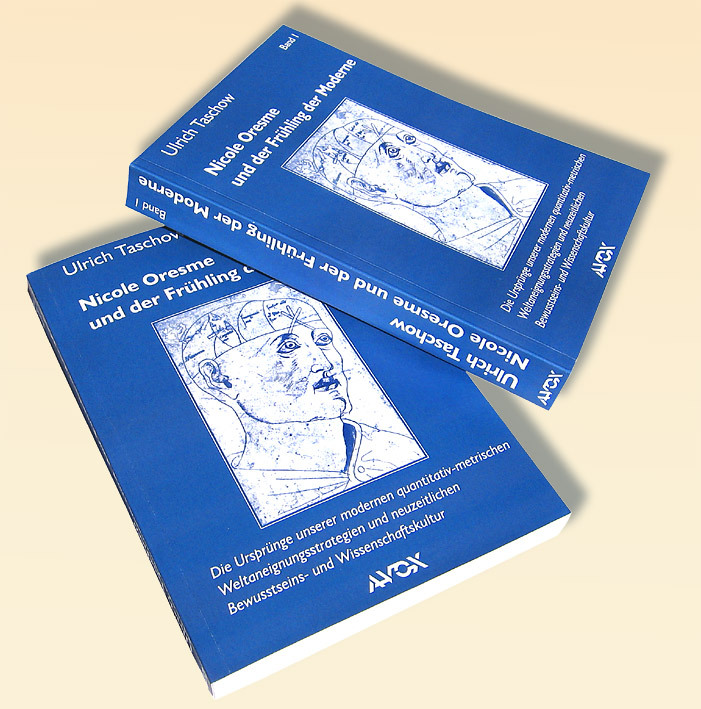 See Ulrich Taschow, Nicole Oresme und der Frühling der Moderne, Halle 2003, book 4, pages 820-822. See Ulrich Taschow, Nicole Oresme und der Frühling der Moderne, Halle 2003, book 1, pages 150-153.